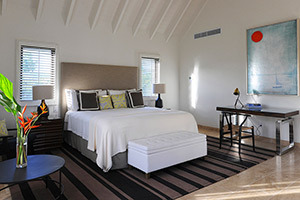 Set between the green lawns and water features of the golf course and the south border of the Resort, our Pinney’s Beach villas are some of the closest to the ocean. 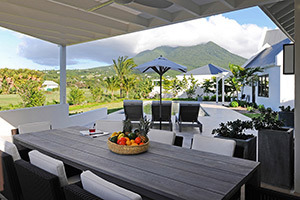 Combining Caribbean touches and a Mediterranean courtyard layout with contemporary flair, the architecture is designed to encourage indoor-outdoor living and provide spectacular views – without sacrificing privacy. 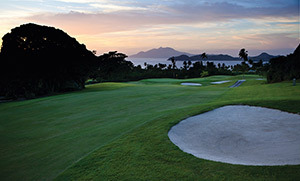 A short stroll from the amenities of the Four Season Resort Nevis, the thee-bedroom Villas at Pinney's Beach look across the 4th fairway to the driving range and the opening greens of the Robert Trent Jones II golf course. 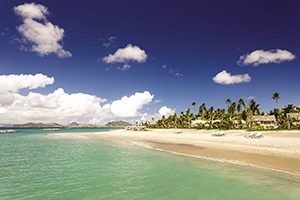 To the east, the lush slopes of Nevis Peak rise on the horizon. 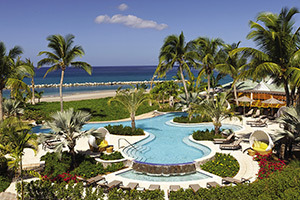 To the west, a fringe of palm trees marks the Resort on the shore of the Caribbean sea. 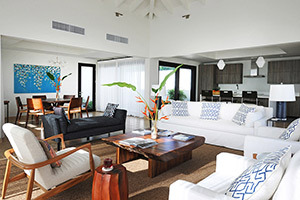 The Villas at Pinney's Beach are a very close walk to the water and feature contemporary design and decor, ranging from exposed beams and sloping to tongue-and-groove ceilings, coral stone flooring and high-tech kitchens. 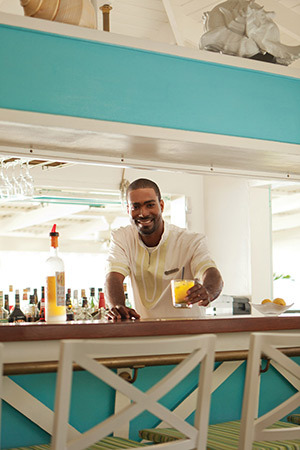 Guests of the Villas at Pinney's Beach have full access to the Resort's amenities and activities. 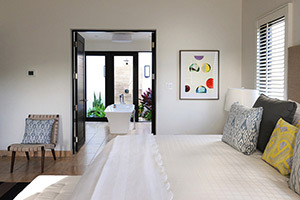 From water sports to beachside lounging, spa treatments and culinary experiences, guests will love the hotel feel while living in a private residence. Spend the day lounging by the pool in your private accommodations and watch the sun go down before the stars come out and light up the night sky! 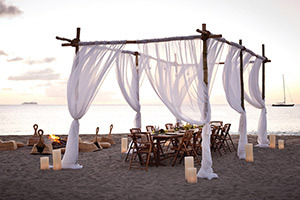 Just a 3 minute walk from the Resort, golf course, restaurants and the spa, Pinney's Beach Villas provide guests with the perfect combination of privacy within your own beachside estate and access to all Resort amenities. 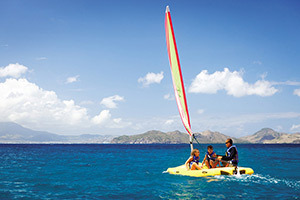 From snorkeling to sailing, exploring Nevis holds adventure at every turn. 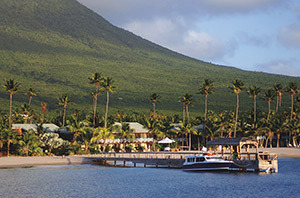 With a consistently pleasant climate, the unspoiled island of Nevis gives visitors the opportunity to experience the Caribbean in all its natural splendor, in addition to the service and amenities you expect from Four Seasons. 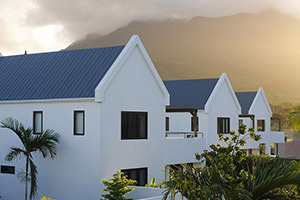 Fully air-conditioned, except staircase to second floor; Kitchen Appliances: Bosch or Thermadore appliances, cooktop oven, microwave, refrigerator/freezer, washer/dryer and Nespresso coffee machine; Living Room has 54-inch Samsung TV and Sonos sound system, Upstairs Master Bedroom and Guest Master Bedroom each have TVs; Three full en suite bathrooms and one powder room; Private swimming pool; Garden view and fourth hole of golf course; Laundry Facilities are Maytag brand, located within closet; iron and ironing board; Nearby Amenities-Pinney's Beach, Sports Pavilion (golf pro shop and spa), Resort swimming pools and the Great House; Twice-daily housekeeping service; Room Service available from the Resort; Provisioning available upon request; Private chef may be arranged through the Resort.